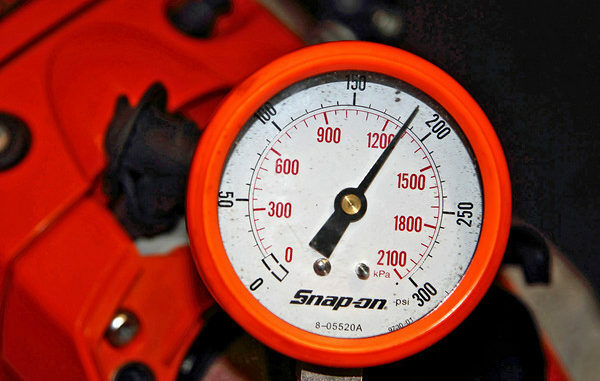 A healthy Yamaha snowmobile motor should have compression over 100 psi per cylinder. Inadequate cylinder compression pressure will result in a loss of engine performance. Insufficient compression is a sign the engine’s piston rings, valve seats or valves are wearing. It can also be an indication of engine damage. This article details cylinder compression testing procedures and specifications for the 2007 and 2008 Yamaha Phazer and Yamaha Venture Lite 500cc 4-stroke snowmobiles PZ50 (PZ-50) PZ50M, PZ50FX, PZ50RT, PZ50GT, PZ50MW, PZ50MT, PZ50W, PZ50GTW, PZ50FXW, PZ50VTW, PZ50MPW, PZ50VT, PZ50MP, PZ50X, PZ50XL, PZ50XW. Measure valve clearance. Refer to download factory service manual “valve clearance adjustment” for step-by-step procedures and factory specifications. Adjust valves if our of spec. Start the snowmobile motor and allow it to warm to normal operating temperatures, and then turn the engine off. Remove fuel tank. Refer to download service manual “seat and fuel tank” section. Use compressed air to blow away dirt from spark plug wells and prevent contaminates from entering the cylinders, then remove spark plugs. Turn the main switch to “START”. Secure the throttle to the wide open position and crank the engine until the compression reading on the compression gauge stabilizes. Measure the compression pressure. If the reading is above the maximum pressure, inspect the piston crown, cylinder head and valve surfaces for carbon deposits. If the compression reading is below the minimum pressure, squirt a few drops of oil into the problem cylinder and test the compression again. If the compression reading is higher when oil is added to the cylinder, the piston ring(s) are worn or damaged. If the compression reading remains the same when oil is added to the cylinder, the cylinder head gasket, piston or valves are most likely defective. NOTE: The difference in cylinder compression pressure between cylinders should never exceed 100 kPa (1 kg/cm2, 14.2 psi). It's highly recommended you download the factory service manual when preforming maintenance or repair to the snowmobile. The manual covers every aspect of repair, and includes a wealth of diagrams, illustrations, photos and easy-to-understand repair guides.